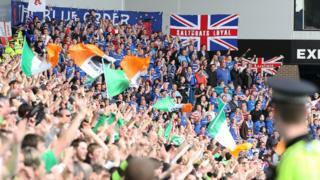 Image caption Sectarianism was described as a "vile cancer" - and not just connected to football. Football clubs have been warned that the Scottish government will act if they do not root out sectarianism in the sport. Justice Secretary Humza Yousaf said the "vile cancer" was a societal problem, and was not just connected to football. But he said there were far too many incidents of sectarianism around football grounds. He said clubs must say how they will tackle the problem - and if not, "all options" remain on the table. It comes after a recent Scottish Police Authority board meeting heard how offensive behaviour at Scottish football matches had increased in the last year. Officers have been attacked and spat on and a police horse also required treatment after it was hit with a flare, the board heard. Mr Yousaf also announced an additional £530,000 for anti-sectarian organisations, bringing the total allocated to £14m since 2012. The government's controversial Offensive Behaviour at Football Act, introduced in 2012, was repealed in 2018. Sectarianism, once dubbed "Scotland's shame", recently returned to the headlines after Kilmarnock manager Steve Clarke highlighted the verbal abuse he received from Rangers fans. Speaking to BBC Scotland, Mr Yousaf said he would be prepared to legislate again. Image caption Mr Yousaf said licensing laws could be examined among efforts to crack down on offensive behaviour. He said: "When it comes to legislation, my challenge to the football clubs and others is: 'Show me how you're going to act. Tell me how you're going to root this out'. "But if you don't then we reserve the right to act. "And I'll look at legislation we currently have, like licensing laws for example. I'll look at potential solutions like strict liability for example, and we will not rule them out and we will not take them off the table. "So all the options remain very firmly on the table." Mr Yousaf said the government would do whatever was within its power to tackle bigotry, including at football, marches and parades or in work places. As he announced grants to projects tackling the issue at school-level, he said education was pivotal. A grant of £85,000 was given to Sense Over Sectarianism (SOS), which supports pupils in Glasgow to recognise and combat bigotry and provides training for teachers across the country. Development officer, Mark Adams said: "In the past 12 months SOS has worked with unprecedented numbers and this funding gives the programme a solid platform to build on and consolidate this success. "In addition we will be able to once again host the national month of action for Scottish schools which proved very popular in February of this year." Another project to benefit from the new round of funding was Nil By Mouth, which provides free anti-sectarian education in workplaces. Director Dave Scott said: "We have seen huge interest in our tackling sectarianism in the workplace programme in recent years with more than 125 employers participating, including more than a third of Scottish local authorities. "Scotland is bigger, better and bolder than bigotry and this welcome investment in grassroots projects like ours will take that message to schools, colleges, universities, workplaces and communities right across the country and help people find their voices on this issue." Prof Duncan Morrow, former chair of the independent Advisory Group on Tackling Sectarianism in Scotland, said: "The past few months have shown that sectarianism remains a problem in Scotland. "There is no doubting that progress has been made, especially in communities, but it will continue to rear its head if it is not faced and addressed firmly. "I am pleased that the Scottish government remains committed to tackling sectarianism, and hope that others outside of government will now show the leadership that has been lacking for so long."